$1.99 (regularly $3.99) 5/7/2017 - 5/31/2017! From the warped mind of Lance Carbuncle comes another genre-defying tale of mayhem, madness, and revenge. When a portal to the netherworld spews noxious fumes over an entire town, the villagers are collectively driven mad and direct their murderous rage toward one outcast youth. With almost the whole town set against him, Greg Samsa does the only thing he can, turning to his deceased grandfather’s occult paraphernalia to help defend himself. 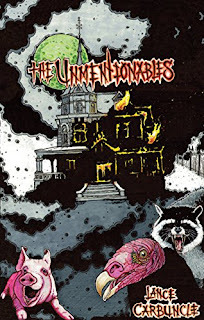 In the attic of his dilapidated family mansion, Greg builds an army of reanimated fetal pigs, stoner lunkhead servants, flying piss-monkeys, and raccoon bodyguards. Greg has taken all that he can stand. The villagers want him and his family gone. It’s all headed for a savage, gore-splattered showdown between good and evil in small-town Ohio.